Mercedes 2007 -2009 c230 cambelt change instructions and replacement inteval. Full guide! Crankshaft turning tool – No.001589650900. Flywheel/drive plate locking tool (bell housing) – No.112589034000. Timing chain link installer – No.272589003900. Timing chain link installer die kit 1 – No.272589006300. Timing chain link installer die kit 2 – No.272589016300. Timing chain link installer die kit 3 – No.271589016300. Timing chain link kit – No.272589036300. Timing chain link separator (item 1) – No.602589023300. Timing chain link separator (item 2) – No.602589056300. Timing chain link separator (item 3) – No.602589056301. NOTE: Timing chain can be changed without dismantling engine. Using the tools listed above, the new chain can be linked to the old, passed round the sprockets and then joined. Engine at 55° BTDC on No.1 cylinder. NOTE: Use 305° mark on crankshaft pulley  . Remove camshaft position (CMP) sensors  . Ensure timing marks on camshaft sprockets aligned  . NOTE: Mark on each camshaft sprocket MUST align with centre of each camshaft position (CMP) sensor hole  &  . Turn crankshaft clockwise until crankshaft keyway at 12 o’clock position  . Ensure balancer shaft counterweight aligned with timing mark on crankcase  . Turn crankshaft clockwise to 40° ATDC on No.1 cylinder  . Ensure camshaft sprocket timing marks at 12 o’clock position  . Ensure timing mark on camshaft sprockets aligned with edge of cylinder head  . Fit new timing chain tensioner. Tightening torque: 70 Nm. Remove tensioner nut (tensioned by spring)  . Remove pin and spring  &  . Push plunger through tensioner body in direction of arrow  &  . Install tensioner body  . Tightening torque: 70 Nm. Insert plunger, spring and pin into tensioner body  ,  ,  &  . Install tensioner nut  . Tightening torque: 50 Nm. 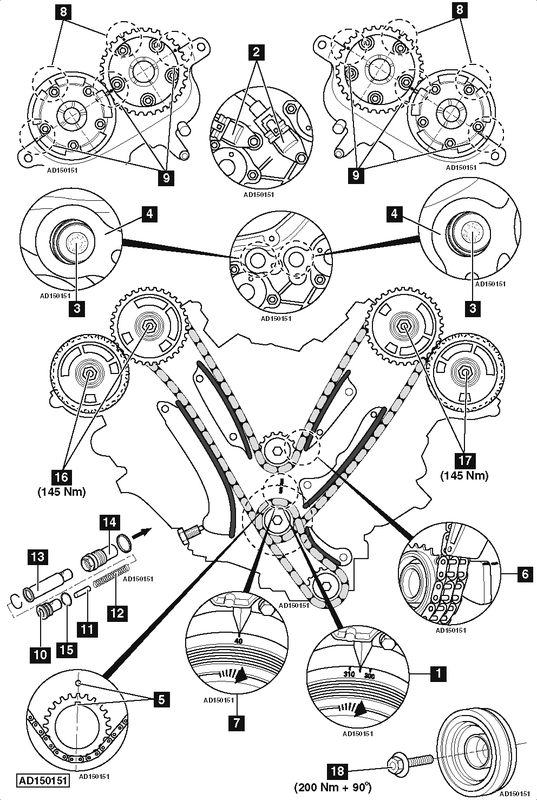 Tighten bolt of each camshaft sprocket to 145 Nm  &  . NOTE: Crankshaft pulley bolt MUST be renewed. Tighten crankshaft pulley bolt to 200 Nm + 90°  .